Camshaft alignment/locking tool – BMW No.11 6 320. Flywheel locking tool 1 – BMW No.11 8 182/11 8 183. Flywheel locking tool 2 – BMW No.11 8 010. Timing chain tensioner locking pins – BMW No.11 3 340. NOTE: Refer to Autodata Technical Data for tightening sequence and torques. Ensure camshaft lobes are positioned as shown  &  . Install camshaft alignment/locking tool on inlet camshaft  . Ensure camshaft alignment/locking tool abuts cylinder head. Install camshaft alignment/locking tool on exhaust camshaft  . Ensure inlet camshaft lobe positioned as shown  . Slacken camshaft sprocket bolts  &  . If necessary, adjust position of inlet camshaft. Hold inlet camshaft with spanner on hexagon  . Tighten inlet camshaft sprocket bolt  . Tightening torque: 20 Nm + 50°. NOTE: Camshaft sprocket bolt MUST only be used once. Ensure exhaust camshaft lobe positioned as shown  . If necessary, adjust position of exhaust camshaft. Hold exhaust camshaft with spanner on hexagon  . Tighten exhaust camshaft sprocket bolt  . Tightening torque: 20 Nm + 50°. Turn crankshaft two turns clockwise. Check valve timing. 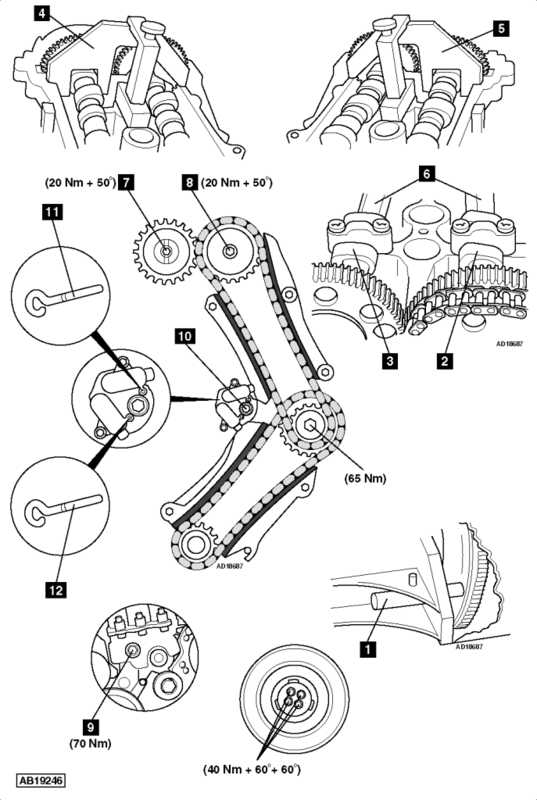 To lock upper timing chain tensioner:NOTE: Only upper timing chain tensioner can be reset with front timing chain cover in place. Slacken oil pressure relief bolt  . Turn inlet camshaft slowly clockwise to compress the upper timing chain tensioner. Insert timing chain tensioner locking pin  . Compress tensioner plunger. Fit timing chain tensioner locking pin  . Remove locking pins  &  . Tighten oil pressure relief bolt  . Fit new crankshaft pulley bolts. Tightening torque: 40 Nm + 60° + 60°. NOTE: Camshafts can be fitted without valves contacting pistons when crankshaft is set at 45° BTDC on No.1 cylinder.